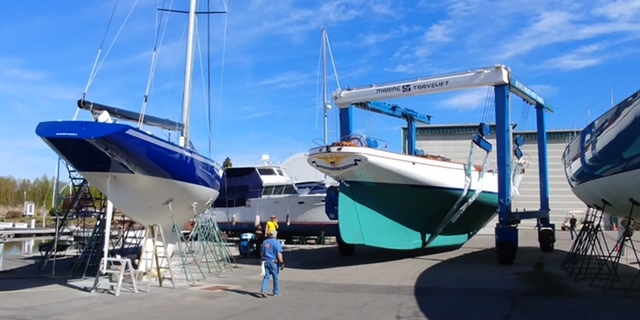 Eben Whitcomb, DN sailor and all around boat guy, sends this shot of two boats getting launched at Pilots Point Marina. The one on the right is TICONDEROGA, a classic ketch. The one on the left is FREEDOM, the 1980 America’s Cup winner. Look closely and you’ll see she is sporting a brand new Composite Solutions Inc rudder (as well as spreaders, boom and spinnaker pole). This entry was posted on 05/15/2017 by Commodore James "T" Thieler DN US 5224. It was filed under 2017 Season .